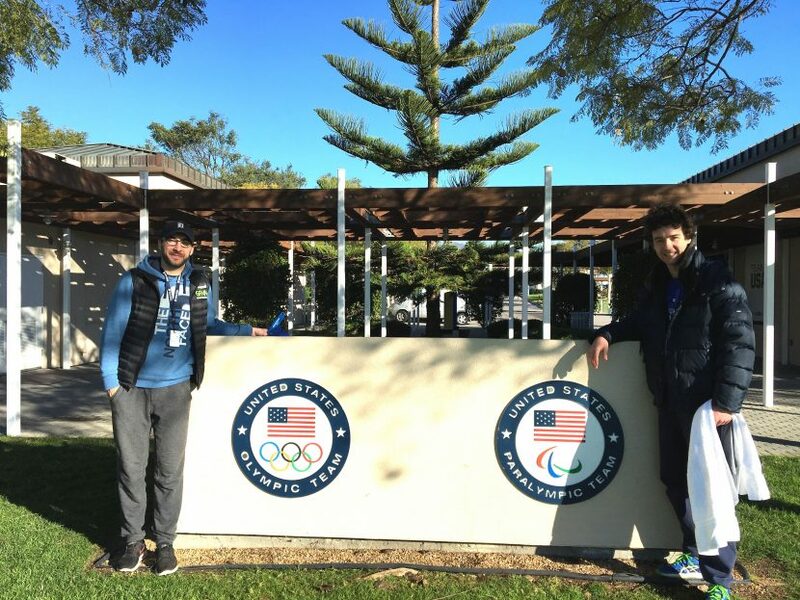 If there is a paradise for sports jocks like myself, the Olympic Training Center of Chula Vista would be close to it. Imagine a 150-acre campus 7 miles south of San Diego, filled with athletes practicing track & field, archery, canoe/kayak, cycling, field hockey, rowing, soccer, softball, beach volleyball, BMX, rugby etc. It’s so much fun to walk around the cafeteria wondering who is who! We pass by a table of four, with sixteen plates, Thomas assumes that they are rugby players. I know, you are probably wondering, what are you doing there Charles? Don’t worry, I’m not offended. I’m a decent athlete, but I’m fully aware that I’m far from the Olympic level! I am there with Thomas, my guide, for a boot camp organized by Amy Dixon, a blind triathlete from Team USA. There is 15 of us blind triathletes, from all over the country, all absolutely amazed and feeling a little out of place. Our boot camp starts with a beautiful easy ride in the desert, close to the Mexican mountains. I am a happy child, pretending to be something between Clint Eastwood and Greg LeMond. But quickly things get more intense. Each day is closely regimented. We swim, bike and run for about 8 hours, just like professional triathletes. We are coached by la crème de la crème, treated like champions. Every night, around 8:30 I fall asleep, totally bushed, wondering if I could ever get used to this lifestyle. I feel like a monk, totally devoted to my sport, in a meditative state, driven by a powerful group. In those moments, I can think of only two things, my goals, and the people I love. Today tandem practice was in the mud, it was my first time doing cyclo-cross with Thomas, we learned a lot. It might be surprising, but the most important lesson is that we have to communicate well. It feels like a couple’s therapy, I tell him what I need to know, he tells me how we can improve, in a few days, we have more matured as a team than in the past six months. I call my wife after lunch, I tell her that I am exhausted and covered with mud, she simply says: “Wow, you must be happy then!” She knows me so well. It is such an honor to be surrounded by champions, Olympians who sacrificed so much to reach a level that I can only dream of. I’m running on the track during a workout of the pole vaulters, I can hear them accelerate, jump, and glide over the bar with a finesse and a poetry that I can’t describe. I could sit there for hours. As I am getting ready to leave, I realize how much I will miss this place. A powerful part of me wishes I could stay. There is this hubris telling me: “you belong here Charles!” But I know that my place is elsewhere, with my family. Those Olympic rings will haunt me, I understand how one can easily become obsessed. What an incredible experience, what a fascinating place.